At St Swithun’s School, we follow the Inspire Maths scheme, which is based on the Singapore Maths model and incorporate all statutory objectives of the National Mathematics Curriculum. We teach key skills to ensure that the children are fluent, have the ability to problem solve and reason using Mathematical vocabulary. Maths is taught daily and follows the concrete, pictorial and abstract model so that children can fully understand Mathematical concepts and forge their own links between learning. To support the concrete stage of learning, we use a range of practical resources to give structure to numbers; this includes Numicon, Cuisenaire rods and dienes. In addition to the ability to logically work through all calculations and problems, using a range of practical resources and written strategies, the children are encouraged to develop their ability to reason and explain their thoughts and in-depth mathematical problems. This is a particular focus of Inspire Maths and is supported through the use of talk partners. 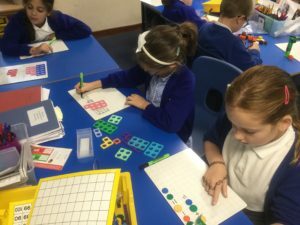 At St Swithun’s, we are determined to provide children with engaging, practical lessons that allow them to learn and use essential Mathematical skills needed throughout their lives. This includes providing cross curricular opportunities for Maths in Geography and Science.